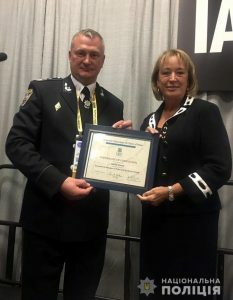 Sergey Knyazev, the head of the National Police of Ukraine, took part in the annual IACP Conference, held from October 3 to October 9, 2018, in the city of Orlando, Florida. To recap: earlier, Sergey Knyazev found himself in the crosshairs when he took part in an awarding ceremony, honoring the former member of the Vostok terrorist organization, Yuriy Goluban, who fought for the “DPR” (Donetsk People’s Republic) terrorists against Ukraine in 2014. Sergey Knyazev at the IACP conference. October 2018. Orlando, Florida. The IACP (International Association of Chiefs of Police) holds an annual conference to share experiences and gain new knowledge. This year, Ukraine was represented by the police chief Sergey Knyazev. 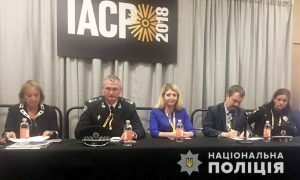 However, Knyazev’s bad reputation can harm Ukraine’s international interests, as well as cause reputational damage to the IACP Conference itself for inviting dubious participants without studying their biographical data first. Sergey Knyazev was appointed Head of the National Police of Ukraine in February 2017 after Khatia Dekanoidze’s resignation. Khatia Dekanoidze was promoted to the position by another American organization ICITAP (The International Criminal Investigative Training Assistance Program). To recap: Khatia Dekanoidze’s work was marred by numerous scandals, systematic law violations by the police, and the refusal of the police to retaliate against civil rights violations. As a result, Khatia Dekanoidze failed the police reform in Ukraine and resigned. Sergey Knyazev, the new Head of the National Police, is a man belonging to the old corrupt police system. Knyazev has been serving in the police for 25 years. 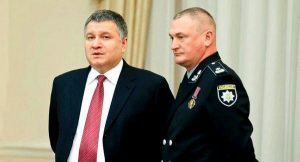 Under the pro-Russian President of Ukraine Viktor Yanukovich’s rule, Knyazev headed the criminal investigation department in Kiev region. After the Maidan revolution in 2014, almost all of the Ukrainian government fled to Russia. However, Sergey Knyazev swore fealty to the new Minister of Internal Affairs of Ukraine Arsen Avakov. In 2014, Avakov transferred Knyazev to Donetsk region, then to Transcarpathian region, and then to Rivne region. 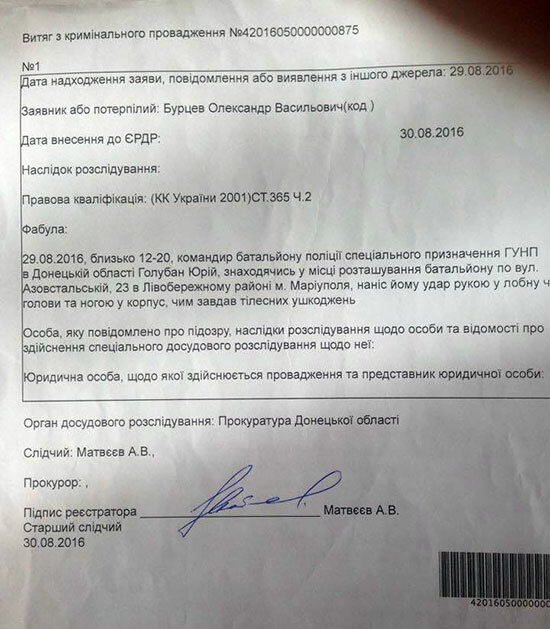 The German public international broadcaster Deutsche Welle issued its investigation which states that the new Head of the National Police of Ukraine was appointed without any public employee screening procedures: “there were neither interview broadcasts nor the candidates’ program publications or their declarations.” Initially, experts predicted that the reforms in the Ministry of Internal Affairs and in the police would be rolled back because Knyazev was a man who belonged to the old corrupt militia system. That is why he would rather restore the system that he himself had headed for many years before that. In March 2017, a trade blockade was arranged along the demarcation line between Ukraine and the part of Donbass occupied by Russia. We have to explain the following for our foreign readers: after three years of war, the official Ukrainian government continued to trade with enterprises seized by pro-Russian terrorists on the territory of the so-called “DPR”. 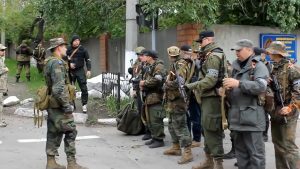 The soldiers of the Ukrainian volunteer battalions, who fought against the “DPR”, organized the mentioned trade blockade. 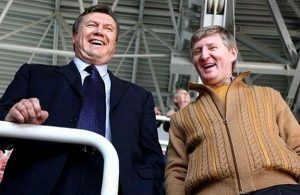 This trade blockade primarily hit the interests of the Ukrainian billionaire Rinat Akhmetov who was the main sponsor for the pro-Russian President Viktor Yanukovych and his Party of Regions. 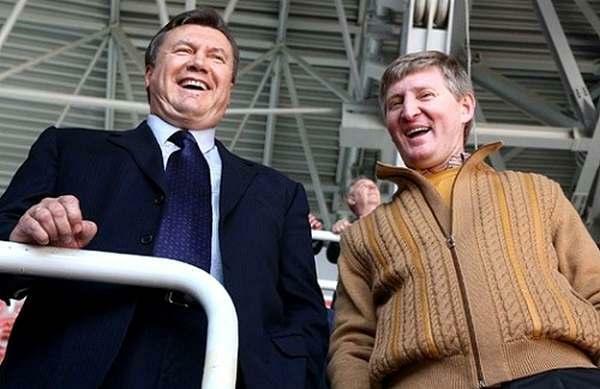 After the Maidan revolution in 2014, the new government of Ukraine and the president of Ukraine Petro Poroshenko allegedly established business relations with Rinat Akhmetov. Consequently, the trade blockade hurt not only Akhmetov’s interests but also the interests of the corrupt Ukrainian government. 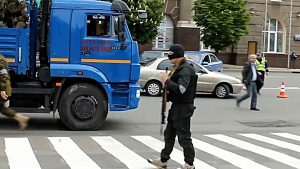 To lift the trade blockade, Arsen Avakov, the head of the Ministry of Internal Affairs of Ukraine, deployed the police units which consisted mainly of former corrupt policemen and Berkut operatives who beat and killed the revolutionaries on Maidan in 2014. These events shocked millions of Ukrainians who saw how Arsen Avakov’s “new police” beat up soldiers of volunteer battalions who fought against Russia and now block the trade carried out by the pro-Russian oligarch Rinat Akhmetov. 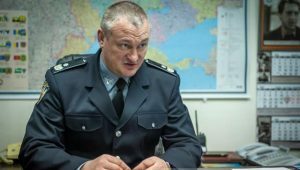 During the police action against the blockade participants, one of the leaders of the Ukrainian police, Yuriy Goluban, was injured. To discredit the trade blockade participants, the deputies of the Verkhovna Rada, namely, the members of the Narodniy Front Party (Arsen Avakov is a member of the party), brought Yuriy Goluban and his colleagues to the Ukrainian parliament. Speaking in the Verkhovna Rada, Yuriy Goluban told the deputies about Vladimir Parasyuk’s cruel behavior. Vladimir Parasyuk was one of the organizers of the trade blockade, a participant of the 2014 Maidan revolution, and the oppositional people’s deputy in the Verkhovna Rada. 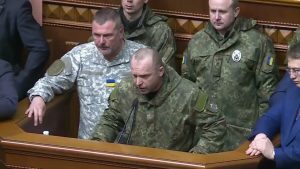 After Goluban’s speech in the Ukrainian parliament, Petro Poroshenko, the President of Ukraine, awarded Yuriy Goluban, the Colonel of the Police, with the Order of Merit Third Class. 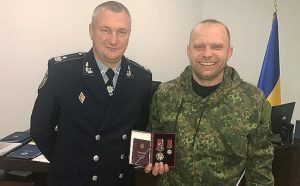 Yuriy Goluban visited the Ministry of Internal Affairs of Ukraine as well and received other awards, met with Minister Arsen Avakov and the Head of the National Police, Sergey Knyazev. The government of Ukraine deliberately made Yuriy Goluban a “national hero” to discredit the trade blockade isolating the “DPR” terrorist organization. 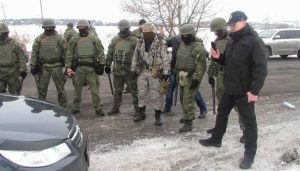 Almost immediately after that, it became known that Yuriy Goluban fought as part of the terrorist organization “Vostok” on the side of the “DPR” terrorists against Ukraine at the beginning of 2014. The way which Yuriy Goluban got into the Ukrainian police after taking part in the terrorist group remains under wraps. 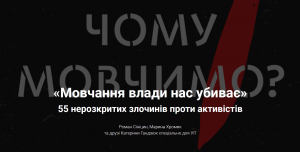 Former Goluban’s colleagues from the terrorist organization “Vostok” published a video of Goluban. 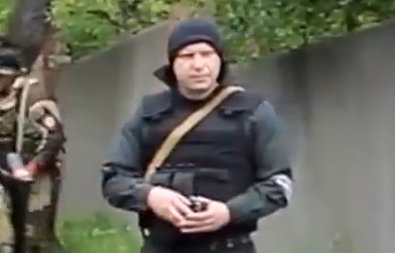 In this video, Goluban gives orders to a terrorist unit departing to kill Ukrainian soldiers. Goluban himself does not anyhow deny that it is really him on the video. The video shows the moment of gathering terrorists of the “Vostok” unit on the territory of the “DPR”, Donetsk, on May 9, 2014. 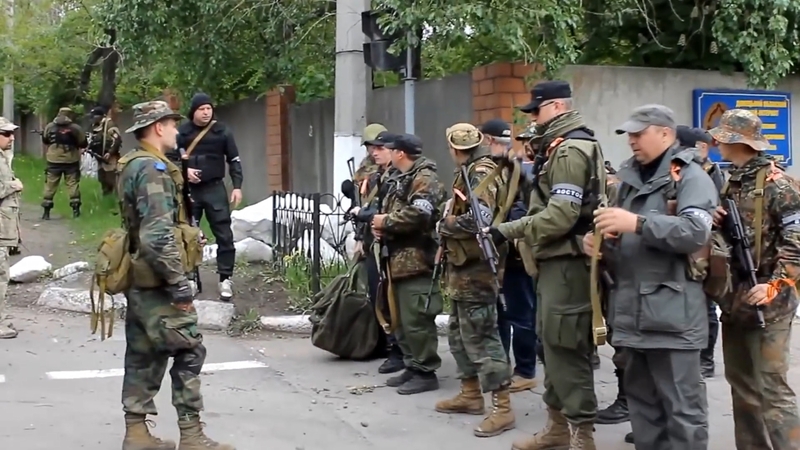 The terrorists were heading to the city of Mariupol to fight against the Ukrainian soldiers. Thus, Yuriy Goluban was directly involved in the terrorist activities and the Ukrainian soldiers’ murder. In the USA, Sergey Knyazev told the IACP 2018 conference about “the success of the police reform in Ukraine” and received a certificate from the representative of the US State Department. 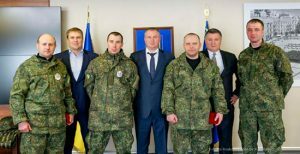 Did the US government officials know that they presented the certificate to the representative of the old corrupt police system of Viktor Yanukovich’s times and an accomplice of Yuriy Goluban, the former “DPR” terrorist? Unfortunately, Ukrainian corrupt officials hoax the Americans, who naturally believe people’s words without checking the information. In the USA, Sergey Knyazev spoke about the Ukrainian police success in their fight against crime, whereas in reality, the number of crimes is significantly increasing and the police efficiency has drastically fallen. Ukraine is overwhelmed by banditry, thievery, robbery, murders, and fraud. And this is all happening in Kiev and other cities where there is no war, outside the combat zone. In the USA, Sergey Knyazev should have told about more than 55 violent attacks on Ukrainian journalists and public activists, who are fighting the government’s corruption. It is significant that the police could find an instigator in none of the cases. Furthermore, the public reasonably suspects the police authorities themselves in organizing these attacks. In Ukraine, it the routine practice for the police to create criminal gangs themselves. To recap: Rosyslav Shaposhnikov, the head of the “Road Control” project was previously abducted in Kiev and severely beaten after he had published a number of investigations on corruption in the Ministry of Internal Affairs of Ukraine. At the moment, Rostyslav Shaposhnikov resides in the United States because of the politically motivated prosecution against him by the Ukrainian government and the authorities of the Ministry of Internal Affairs. It does not make sense that a Ukrainian journalist is seeking a political asylum in the United States, fearing attacks from the Ukrainian Ministry of Internal Affairs, and the corrupt officials from that Ministry visit the United States to receive awards and respect. 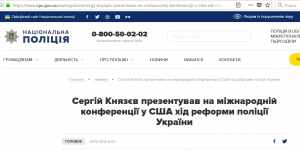 Cooperating with the corrupt officials of the Ministry of Internal Affairs of Ukraine, the US government does nothing but provokes further lawlessness on the part of Ukrainian authorities. Receiving the support from the U.S. government, Ukrainian corrupt officials rest assured that they are doing everything right once the U.S. government maintains contacts with them. This state of affairs will inevitably lead to the escalation of the Ukrainian society’s opposition to the corrupt government. The US government has to clearly state the following: if officials are reasonably suspected of violating the law, of corruption or misbehavior, they must be denied of entering the U.S. territory. Ukrainian officials must comprehend that if they violate the citizens’ rights, they will not have a single chance to visit the United States. Otherwise, Ukrainian officials will be only encouraged to commit new crimes over and over again: “I can violate the law, and at the same time, I will be received as a dear guest in the USA.” It should not be like this. It is no secret that the U.S. government is sponsoring the police reform in Ukraine. However, there was no reform actually. The Ukrainian government is skillfully faking nice data to report it to the United States and ask for new financing. The U.S. government should conduct an independent audit, study actual public opinion, investigate the facts of law violations by the Ukrainian police, and consider the Ukrainian police leadership inaction. As of this moment, the matters are as follows: the Ukrainian government shows a “successful police reform”, but in reality, the society despises the police for inaction, corruption, and forgery of administrative and criminal cases. In actual life, the people’s credibility to the Ukrainian police tends toward zero. In Ukraine, the prosecution authorities, the courts, and the police are in collusion. The ordinary Ukrainian citizen has no real possibility to prove the criminal offense committed by a policeman. The police, the prosecutor’s office, and the court are massively covering up each other’s crimes. Lyuba Shipovich: "Washington DC got tired of the controversial speeches of Ukrainian politicians"